“Entourage” Has Blown Me Away – I Love That Show! Entourage is not a new tv show. It first began in 2004 and is now up to its 7th season. I’ve heard about the show a few times but thought it sounded boring. I mean, it’s about this actor guy in Hollywood who hangs out with his 3 friends, one being his manager, another being his brother and the third is a friend of them all. Sounds boring, right? Yeah that’s what I thought. But I had this one friend who just couldn’t stop talking about it. So I found a few of the first episodes and I was hooked immediately. I went straight to Amazon to purchase the DVDs for the first season ($17 at Amazon US – click here). Even before I finished first season, I had also ordered season 2, 3, 4, 5 and 6. I just began watching season 6 so I’m almost through the entire show – just need to wait for season 7 to be out on DVD. I hate watching TV shows that only airs one episode per week – if I find a show I like, I’d rather wait till at least one season is out so I can purchase the complete season and watch multiple episodes after one another. 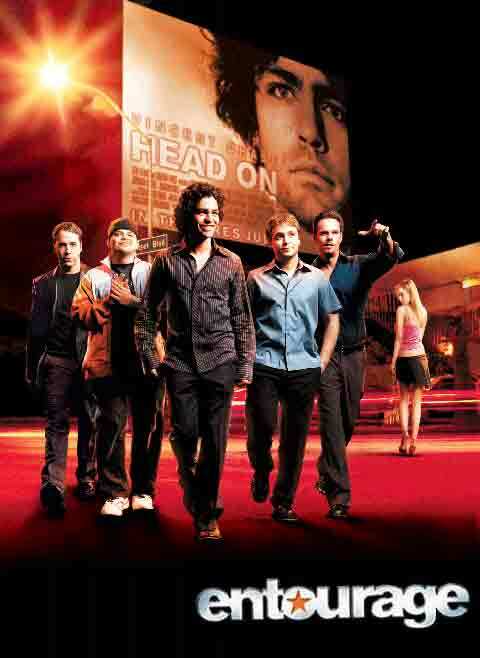 Entourage is an American comedy-drama television series that premiered on HBO on July 18, 2004. The series was created and is largely written by Doug Ellin and chronicles the rise of Vincent Chase, a young A-list movie star, and his childhood friends from Queens, New York City, as they navigate the unfamiliar terrain of Hollywood, California. Mark Wahlberg and Stephen Levinson serve as the show’s co-executive producers, and the show’s premise is loosely based on Wahlberg’s experiences as an up-and-coming film star. The series deals with themes of male friendship and wild life in Hollywood. In accordance with this, numerous celebrities have guest-starred on the show. Executive producer Mark Wahlberg confirmed that after the seventh season, six more episodes will air in 2011 concluding the series, which will then be followed by a film adaptation. I would love to show a few “best momens of <insert character name here>”-videos, but there’s no point. If you haven’t seen the show yet, you probably wouldn’t find them funny. I suggest you give it a shot, chances are you’ll like it. Entourage has an IMDb score of 9.2 out of 10 – that’s really, really good! You can click here to purchase the Entourage DVD’s on Amazon US. Since I’ve seen every Bones episode at least three times, I believe I’m ready for a new series, might give this a try! I love that show. I saw it once and was totally love it. I’m the same – I don’t watch the shows on TV but after the dust settles and they come out on DVD I watch them episode after episode. That’s how I watched and loved Lost, Supernatural, House and now the first season of Mad Men. Loved them all and Entourage is on my list too. I have not seen the shows of it and i don’t know anything about it ,as i think about it , it will be very interesting because it is about supernatural powers and i love that type of shows…………. Was a decent show. Certainly went downhill though in the final 2 seasons.